Sometimes, when you stretch a certain way, you may notice a popping or cracking noise in your joints. If you have ankle pain and soreness, stretching so that your ankle deliberately cracks can sometimes give you the relief you need. Cracking your joints is perfectly normal and is not dangerous, although the sound can sometimes bother people who are nearby. 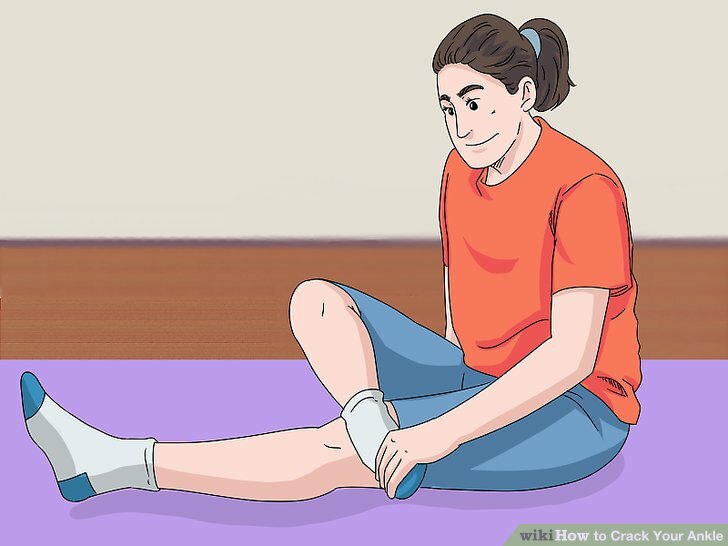 If you want to crack your ankle, try one of these stretches, but stop right away if you experience pain while you’re doing them. Stand up straight with your foot held out in front of you. Your foot should be slightly off the floor with enough room to flex it in different directions. About should be enough. If you feel unsteady, place your hand on a wall or a piece of sturdy furniture to help hold your balance. If you need to, you can also do this exercise sitting down. Point your toes forward as much as you can for about 15 seconds. Keep your knee straight, and stretch your toes forward either as much as you can or until you feel discomfort. After about 15 seconds, relax your foot back to the neutral position. If your ankle doesn’t pop, you can try again or stretch your ankle another direction. Repeat by pulling your toes back and turning your ankle from side to side. 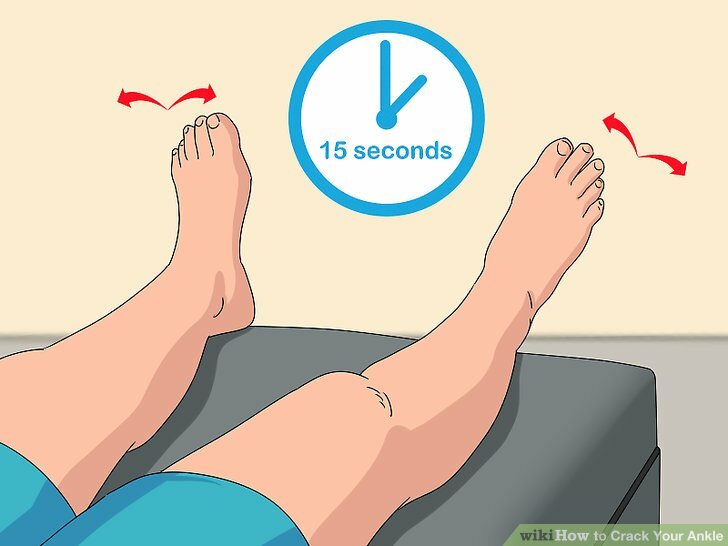 After each move, hold your foot in place for 15 seconds, then relax. Once your ankle pops, you can stop, or you can continue the stretches if you want to loosen your ankle even more. Your ankle will only pop about once every 20 minutes, so there’s no need to continue stretching unless you want to. Try rotating your ankle in circles if it didn’t pop already. Try 5 circles each of small, medium, and large rotations, first counterclockwise, then clockwise. If the stretches didn’t crack your ankle, the rotations may help it to pop. If your ankle doesn’t pop after the rotations, let it rest before trying another method. Switch legs and repeat if you want to crack both ankles. Sometimes, only one of your ankles might need to be cracked, in which case, you don’t have to switch to the other side. However, if you’ve loosened up the muscles in one ankle, it might be best to stretch the other one as well, even if it doesn’t crack. 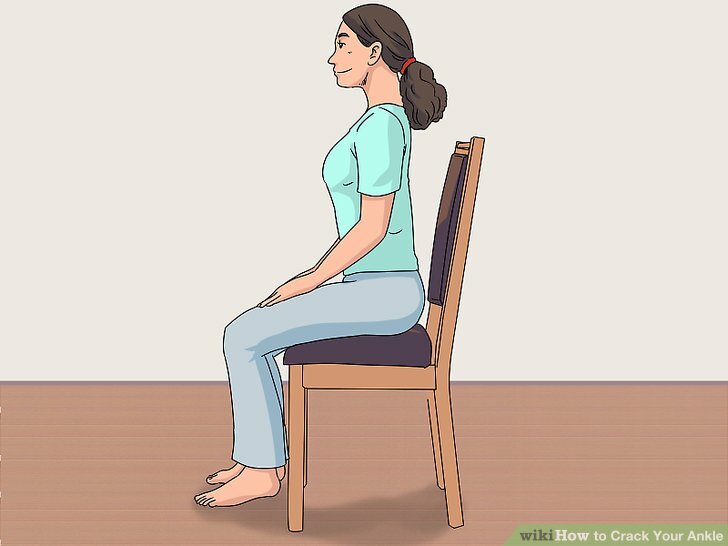 Sit in a chair so your feet don't touch the floor. Make sure you’re well-balanced and comfortable. You’ll be moving your feet for several minutes, and you don’t want to strain your back. If you need to, shift so your weight is resting on the foot that’s still on the ground. You may be more comfortable in a chair with arms, so you can use your hands to help support your weight. Trace the alphabet with your foot, leading with your big toe. By tracing the alphabet, you’ll be forcing your ankle into a variety of different angles and movements that you might not normally perform. One of these motions may be just the thing to crack your ankle. Repeat the alphabet 1-3 times as necessary. Switch and repeat with the other foot. 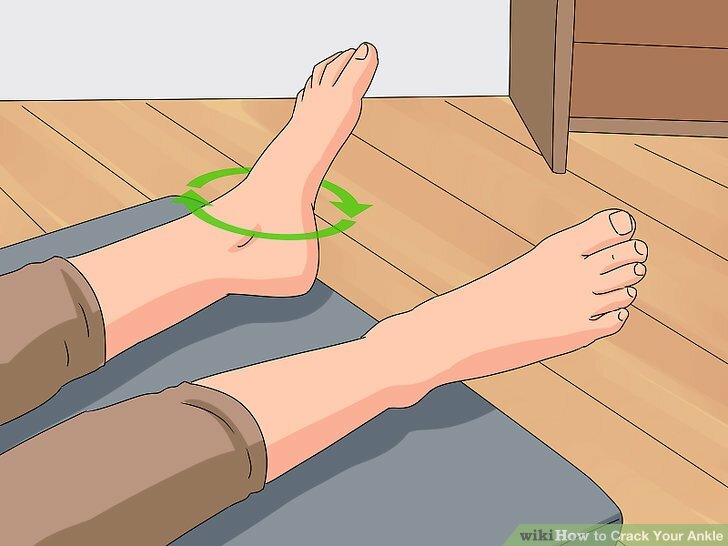 If you want to crack both of your ankles, shift your weight in your chair, return the first foot to the floor, and lift the other foot. Even if your ankle doesn’t crack, it’s always a good idea to limber up both sides of your body evenly. 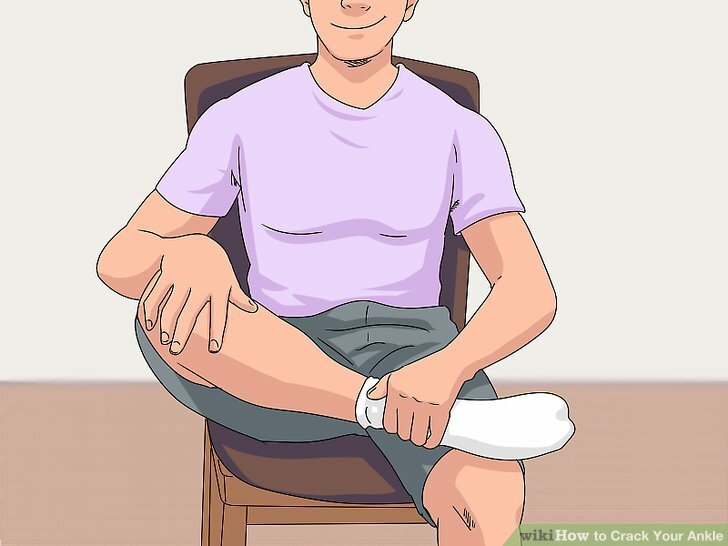 Sit with your legs crossed and put one foot on the opposite knee. For this exercise, you’ll be most comfortable—and stable—if you sit on the floor. If sitting directly on the floor is uncomfortable, you can sit on a cushion or a pile of blankets. You may also be able to perform this exercise sitting on a bed or a couch. Pick one foot up and place it on top of the opposite knee. This will be a sort of modified lotus pose. The outside of your foot should rest on the top of the opposite knee. This position should feel comfortable and not strained. If you feel any discomfort in your ankle, knee, or lower back, stop right away. Guide your foot in circular rotations, first one way, then the other. Make sure you stretch your ankle gently, in slow circles, keeping your ankle extended as far as you comfortably can. However, don’t force your ankle to the point of discomfort. If you need to, you can repeat on the other foot. Stop right away and consult your doctor if any of these exercises are painful.